My irregular Doctor Who rewatch has reached Robert Banks Stewart’s second and last script for the series. First things first, a few plot-holes that have always slightly irritated me. In episode three, Dunbar tells Chase that he’s attended to the Doctor and Sarah (via a decoy chauffeur who’s rather handy with a gun). We later learn that the chauffeur was on Chase’s payroll. Eh? Surely it would have made more sense for Chase to send the homicidal chauffeur to intercept our heroes, especially considering the way that Dunbar reacts in horror to the deaths in Antarctica. So it doesn’t scan that Dunbar is happy to dispose of the Doctor and Sarah in cold blood. Still, it’s some recompense that the chauffeur was played by Alan “Chuntzy” Chuntz, a familiar Doctor Who stuntman who rarely had the luxury of dialogue. When you hear his rather stilted delivery, the reason becomes clear ….. The link between Chase and the stolen pod is done in an incredibly clumsy way – via Amelia Ducat’s painting, left in the car boot. Surely Banks Stewart or Holmes could have found a slightly more nuanced way to bring Chase to the Doctor’s attention. Another slightly baffling moment occurs when Amelia turns up at Chase’s palatial country house to demand payment for the painting. That’s fine, but the revelation that she was sent there by Sir Colin makes little sense. How did he know that the Doctor and Sarah had spoken to her? But a few carps about the plotting aside (like Pyramids of Mars this had to be put together in extreme haste after other scripts collapsed) Seeds is gripping stuff. Tony Beckley’s super-camp performance is an obvious highlight and from his first scene he’s an absolute joy (there’s no doubt that without him the story would sag a little). Mark Jones’ role as Keeler is less showy, but equally impressive. He’s clearly marked as doomed from the moment we first meet him and Jones is perfect as the twitchy, conscience-stricken scientist. Possession has always been a theme in Doctor Who and it’s especially prevalent during the Hinchcliffe/Holmes era, where it’s usually tied in with a body horror theme (Noah in The Ark in Space, Sorenson in Planet of Evil). It’s bad enough to be taken over, but even worse when it results in a grotesque physical change …. Tom Baker’s Doctor dabbles in fisticuffs in a few other stories (such as knocking out Salamar in Planet of Evil) but this is certainly the serial in which he’s in full-on Duggan mode. Had this happened more regularly it would have ended up as a touch monotonous, but there’s something undeniably appealing about the way that he becomes the man of action – springing through the skylight to duff up Scorby at the start of episode four is a definite highlight. “What do you do for an encore Doctor?” indeed. So although the tone of the story is odd and off-kilter (it rather feels like an ultra-violent TV Comic strip) it’s hard not to love The Seeds of Doom. A little pruning (sorry) would have tightened things up – as a four-parter it would have been unbeatable – but I’m not unhappy with what we ended up with. Rewatching Pyramids of Mars for the umpteenth time, a couple of things worried me in episode three. Of course, given that Robert Holmes had to cobble the story together at very short notice (and had clearly run out of steam by episode four) it isn’t too surprising that the odd plothole remained …. Hmm, okay. Lawrence, Doctor Warlock, Ernie Clements (“murdering swine!”), Namin and Collins make five, six if you include Professor Scarman. My first thought was that the Doctor was unaware of one of their deaths, or maybe he didn’t count Namin since he was a baddy? And why did Marcus Scarman, after murdering his brother, gently prop him up into the rocking chair with such obvious care and attention? It creates a shock moment but doesn’t make much sense. Just how many service robots were there? In actuality there were three, so if that was also the true figure why didn’t Professor Scarman immediately twig that that the faux-Mummy (containing a grumpy Tom Baker) was an imposter? Two robots had been guarding the pyramid and Scarman had seen a disassembled third just before killing Marcus. And I’m not even going to ponder exactly when Sarah became so efficient with a rifle. Not that any of this matters as Pyramids of Mars is still great (if rather nasty) fun. Can it really be nearly thirty years since I bought it on sell-through VHS? And a mere twenty three years since I taped the episodic repeat from BBC2, enabling me to see the scenes snipped from the official release for the first time. Time passages …. K9 and Company might be something of a guilty pleasure, but it’s a pleasure nonetheless. When devising a spin-off series for K9, there were already two ready-made possibilities. K9 Mk 1 was on Gallifrey with Leela, whilst K9 Mk 2 was journeying through E-Space with Romana 2. Possibly neither Louise Jameson or Lalla Ward were interested in playing second fiddle to a tin dog, so this left the way clear for the return of Sarah-Jane Smith. 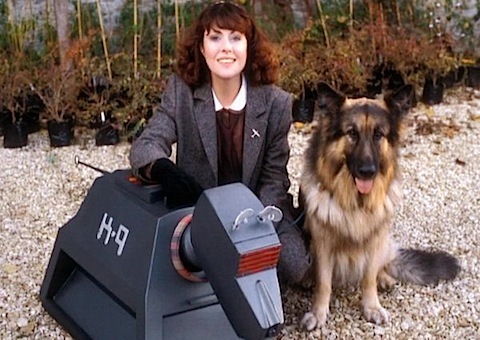 Elisabeth Sladen is, of course, the main selling point of K9 and Company. And although we didn’t know it at the time, this was essentially the first of a two part story (the second, School Reunion, would follow a mere twenty five years later). A Girl’s Best Friend is an odd story. It’s full of red-herrings and innocent people acting in the most suspicious way (in order to con us into believing that they’re wrong-‘uns). Colin Jeavons and Bill Fraser liven up proceedings with some interesting performances that teeter on the edge of credibility (and Jeavons later topples over completely). Given that a running thread through the story is the mysterious disappeance of Aunt Lavinia, it’s a little anti-climatic to find out that nothing at all has happened to her. And the reason why Brendan (Ian Sears) should be lined up for sacrifice is a bit vague – unless it was explained and I just drifted off for a moment. Terence Dudley’s novelisation managed to put some more meat on the bones of the story (just likes his novelisations of Black Orchid and The Kings Demons) which proved that there was a decent tale buried here, but it just didn’t quite come over on television. For me, The Five Doctors defies critical analysis as to watch it is to be twelve again, when it seemed like the best programme ever. Time may have slightly tempered that enthusiasm, but I still find it’s impossible to rewatch it without a silly grin appearing on my face from time to time. Is it perfect? Of course not. The Five Doctors was a party where many invitations were handed out, but several people (and one very important guest) were unable to attend. Possibly in a parallel universe they had a story where the 2nd Doctor was partnered with Jamie and Zoe, the 3rd teamed up with Jo and the Brig and the 4th and Sarah were reunited. Also in that parallel universe, maybe Roger Delgado decided not to travel to Turkey in 1973 to film Bell of Tibet so that he was able to return to the role of the Master for the first time in a decade. It’s a nice dream. But what we have is still very decent fare. Richard Hurndall isn’t attempting to impersonate William Hartnell, Hurndall is playing the first Doctor, which is an important distinction. The only Hartnell story to be repeated in the UK was An Unearthly Child in 1981, so for many of us Hurndall’s was a perfectly acceptable performance. And it still is. He captures the essence of the Hartnell Doctor, there’s certainly the hard edge Hartnell could show from time to time, for example. Troughton’s back! He may look older, but he’s the major highlight of this story and it’s hardly surprising that they offered him another one shortly after. He has a wonderful partnership with Courtney and all of their scenes fizzle with memorable dialogue. Frankly, I could have watched a story with just these two and been very content. Pertwee’s back! Although his hair’s a little whiter, he’s still recognisably the same Doctor that we last saw nine years previously. But his sequences don’t quite have the same appeal as the Troughton ones and it’s difficult to put my finger on why this is. Terrance Dicks had, of course, been script editor for the whole of the Pertwee era so he should have had no problem in recreating the 3rd Doctor’s characterisation. But he does has some nice moments whilst traversing the Death Zone though, insulting the Master and finding an appropriately heroic way to enter the Tower, for example. Pertwee benefits from being matched up again with Elisabath Sladen. 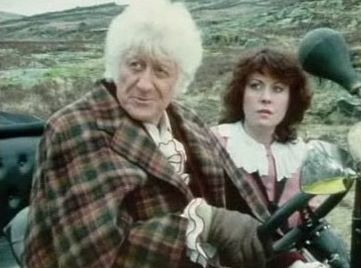 We’d seen Sarah two years previously in K9 and Company which was lovely, but to see her back with Pertwee’s Doctor is something else altogether. Like everyone else, her lines are rationed so she has to make the most of everything she’s given, and this she certainly does. The fact that her mittens are sewn onto her jacket is incredibly adorable as well. Tom’s not back! The reason for his non-appearance is well known and it does leave a hole, but we still have a very good story without him. For many people, Tom Baker was the series, so it’s possibly not a bad thing that he wasn’t here – that way it’s possible to see that there can be a decent tale told without him. Davison’s still here! Terrance Dicks said that he was keen to ensure that Davison got the best of the action and he does have some good scenes, although the Gallifrey section is a bit limp and it’s a pity that he wasn’t teamed up with Troughton and Pertwee a little earlier on. The Doctors were kept apart since there were concerns that egos would clash. I don’t think that Davision would have been a problem, but Jon Pertwee and Tom Baker certainly would have been an explosive combination. 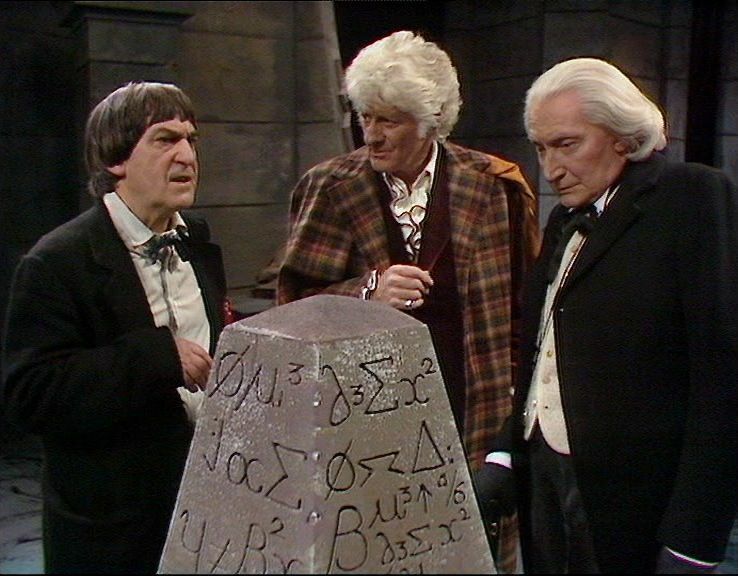 One slight problem I have with The Three Doctors is the way that Troughton is sometimes written down in order to make Pertwee the dominant figure. Since Pertwee was the current incumbent it’s sort of understandable, but I doubt that Pertwee would have been happy to play second fiddle to Davison. And the prospect of Pertwee and Baker together is even harder to imagine. Pertwee never made any secret of his dislike of the way the series progressed after he left (those cynical souls put this down to the fact that Tom Baker was more popular with both the fans and the general audience than Pertwee ever was) so Tom’s non-appearance was possibly a blessing in that respect. As for the monsters, we have a rather tatty looking Dalek but we finally get to see that the Pertwee Doctor was right when he said that: “inside each of those shells is a living, bubbling lump of hate”. Given that it stays in the shadows, presumably the Yeti was rather shabby, but it gives Troughton another lovely comedy moment when he’s rummaging through his pockets in a desperate search for something to sort it out with. Since they only appeared eighteen months previously, it’s a little disappointing that the Cybermen are so prominent here but it makes both economic sense (the costumes were in stock) and also practical sense (it’s difficult to imagine the likes of the Daleks trundling through the Death Zone). Mention of the Death Zone brings us to one of the major plus points of this story – the locations. NuWho has exhaustively mined Wales for locations but as the original series was based in London, trips to Wales were much rarer. Various locations in Gwynedd were used in March 1983 and they help to give The Five Doctors an expansive, epic feeling. If Leonard Sachs in Arc of Infinity wasn’t the best Borusa ever, then neither is Philip Latham here. It’s hard to understand how the Borusa of The Deadly Assassin and The Invasion of Time could have ended up as the lunatic obsessed with ruling forever that we see here. So that makes his corruption (which should be shocking) something of a damp squib. And if the Old-King-Cole Rassilon is another odd move, we do get to see the Doctors together at the end of the story, which is something to be treasured. The rarity is why it’s so special, if it had happened more often then the shine would have been taken off it. As it was, it’s Pertwee’s final bow as the Doctor (sorry, Dimensions in Time isn’t canon, and isn’t even a story) whilst Troughton was to have one more appearance to come. Therefore, while The Five Doctors is a celebration of the first twenty years, it also marks something of an end as over the following years we would start to bid farewell to some of the actors who had done so much to ensure that the series had reached 20 not out. And while they may be gone, thanks to the magic of DVD their adventures live on forever. So for me, that’s the best way to approach this story, as an appreciation and celebration of some of the people that made this programme so special.